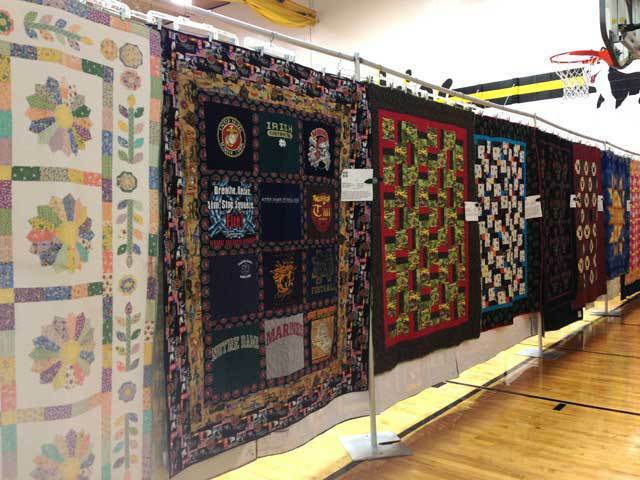 Quilts and quilting have long been part of the annual Covered Bridge Festival, with the Covered Bridge Quilters club hosting an outstanding Quilt Show in the gym at Winterset Elementary School for many years. 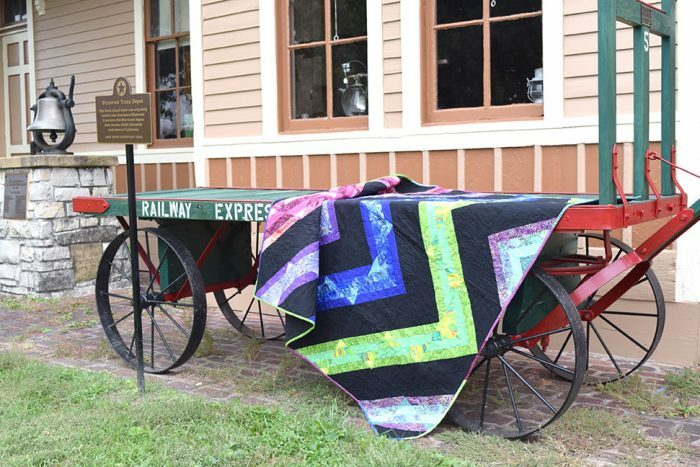 This year, with the addition of the Iowa Quilt Museum and Piece Works Quilt Shop on the south side of the Winterset square, alongside the ever-popular Ben Franklin fabric department, the Festival committee was inspired to name this year’s theme: Quilted Gems: Precious Fabric of Madison County. 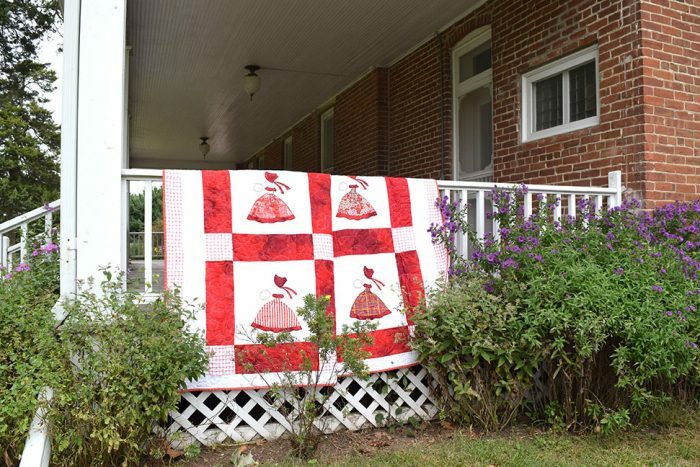 As such, there are lots of quilt-related activities during this year’s festival on October 8th and 9th — if you know when and where to find them! 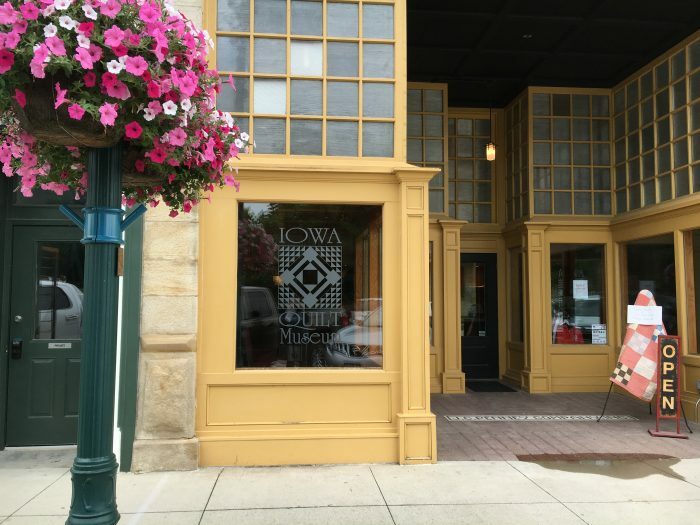 The Iowa Quilt Museum, located at 68 E. Court Ave., opened in May of 2016 and is thrilled to welcome its first Covered Bridge Festival crowd this weekend! 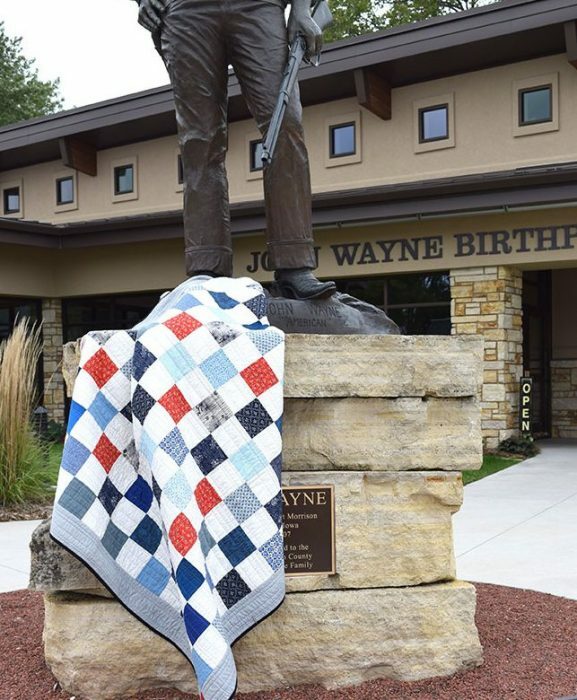 The Iowa Quilt Museum, which has just installed its second exhibit, “Stargazing: American Star Quilts”, will be open for tours all weekend: 9:00 am to 5:00 pm, Saturday and Sunday. They’ll also have extended hours on Friday, the 7th, from 10:00 am to 8:00 pm. Self-guided tours of the facility, with over 30 quilts in various notable star patterns (a historical staple of American quilting) will be available for just $6.00 for adults, and $4.00 for children ages 3-12. 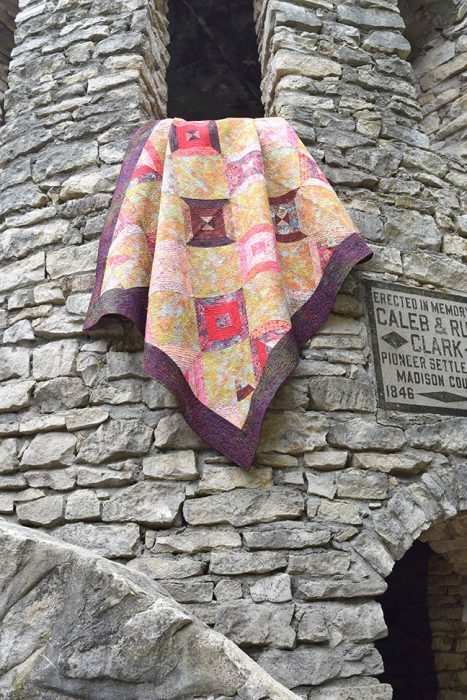 Saturday, 10:00 am, 12:00 pm, 2:00 pm and 4:00 pm: “Patchwork Heirlooms: Care and Storage of Quilts” will be presented by Virginia Berger, Iowa Quilt Museum Curator. 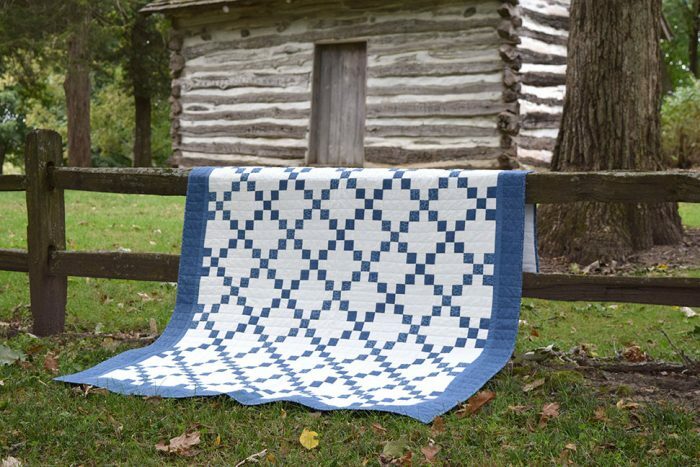 Virginia will share information about ideal conditions for caring for and storing those precious quilts which are, or may someday become, family heirlooms. 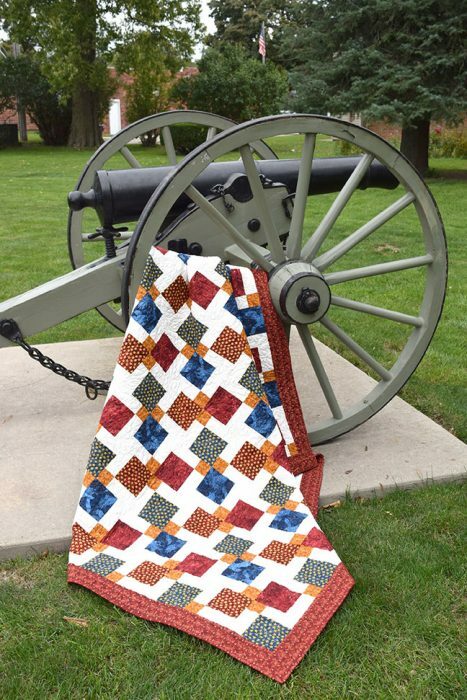 Saturday, 11:00 am and 1:00 pm: “The Abridged History of Quilting” will be presented by Marianne Fons, President of the Iowa Quilt Museum Board. Sunday, 10:00 am and 1:00 pm: “DIY – Barn Quilt Block Painting Demonstration” will be presented by local resident Mark Davis. 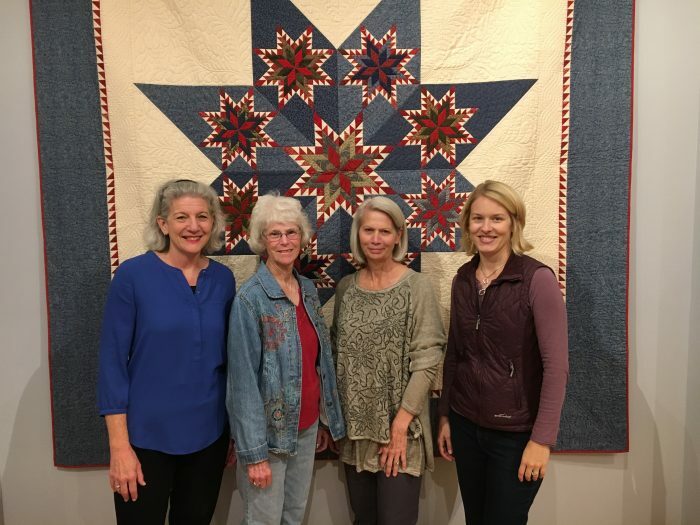 Left to right, in front of one of the quilts in the current exhibit: Marianne Fons, President of the Iowa Quilt Museum Board; Barb Huston, quilter and donor of several popular and lucrative quilts in support of the museum; Brenda Hollingsworth, IQM Board Member; and Megan Barrett, IQM Director. At 3:00 pm on Saturday there will be a Quilt of Valor presentation on the Mel Penrod Stage (south side of the courthouse steps). The quilt is being awarded to Mr. Fred Kuntz, who was the projectionist at the Iowa Theater in Winterset while he was in high school in 1939, and again in the 1950s. Immediately following that presentation, at approximately 3:05, a Live Quilt Auction to benefit the Iowa Quilt Museum will begin. Jon Garrison of Garrison Auction Service has donated his time to assist, and Marianne Fons will be on hand to provide descriptions of the twelve quilts that are included in the auction, all made and donated by local quilters with much appreciation from the Quilt Museum Director and Board. These are the twelve raffle quilts and little information about each. 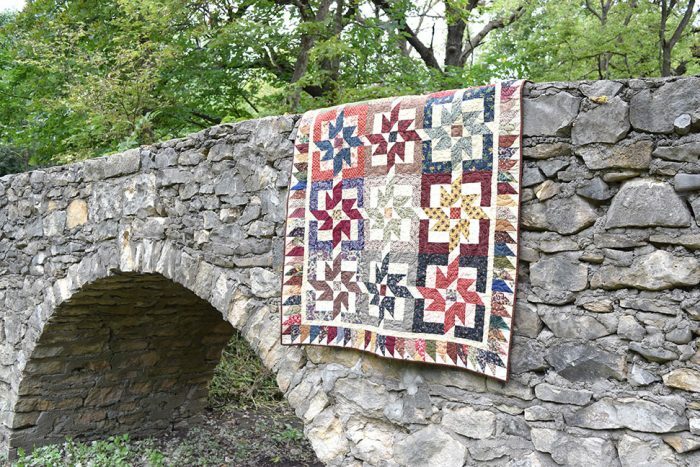 Bonus — many of these photos were taken at famous Madison County landmarks by quilter and manager of Piece Works Quilt Shop, Tony Jacobson. The results are stunning! Right now, and right up to auction time (until it’s time to take them to the stage for the auction), these raffle quilts will be on display in the front (free) area of the Iowa Quilt Museum. Stop by to browse, choose your favorite, and plan your bidding strategy! 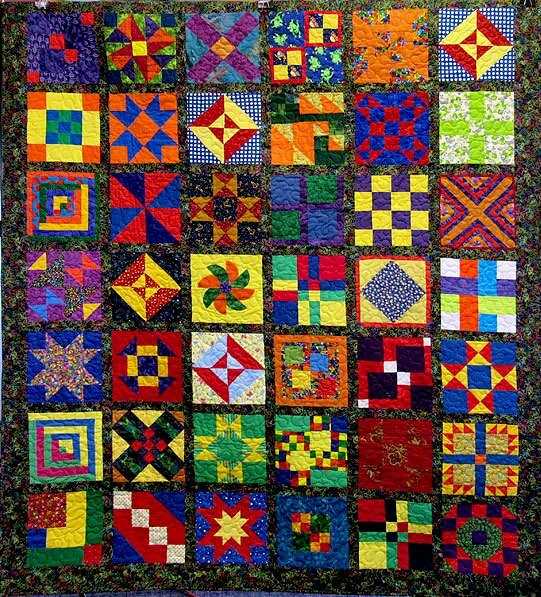 Once again, the Covered Bridge Quilters Annual Quilt Show will be held at Winterset Elementary, 404 S. 2nd Ave., on Saturday from 9:00 am to 5:00 pm, and Sunday from 10:00 am to 4:00 pm. There is a $3 admission at the door. This year’s show will feature a raffle quilt (currently on display at Piece Works Quilt Shop until it moves to the Elementary), a large exhibit area featuring quilts made by CBQ members, a display of baby quilts made for the NICU Baby Quilt Project, member-made items for sale, vendors, and a bargain area with remnants. 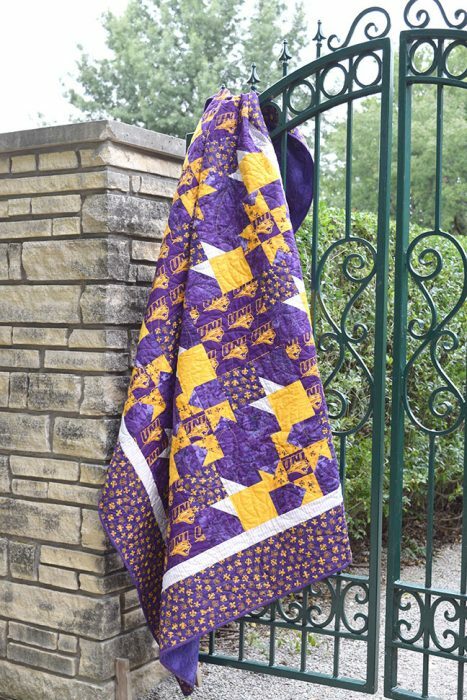 Part of the Quilt Show proceeds go to support their ongoing Baby Quilt Project, for which they make and donate quilts to Mercy Hospital and Methodist Medical Center in Des Moines for their Neonatal Intensive Care Units. This bright and beautiful quilt will be raffled at the Covered Bridge Quilt Show at Winterset Elementary this weekend. 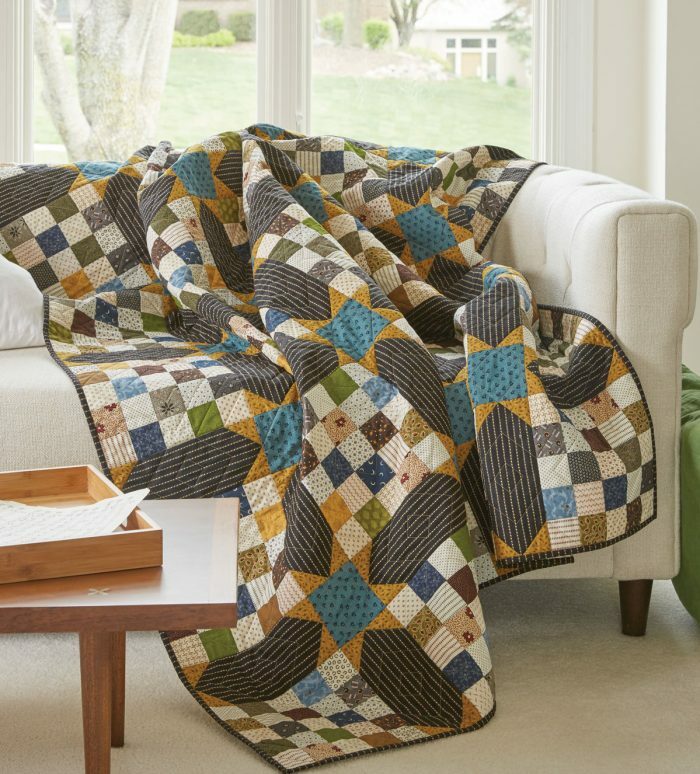 Quilting is an activity passed down through generations, and it’s never too early to involve the kids. 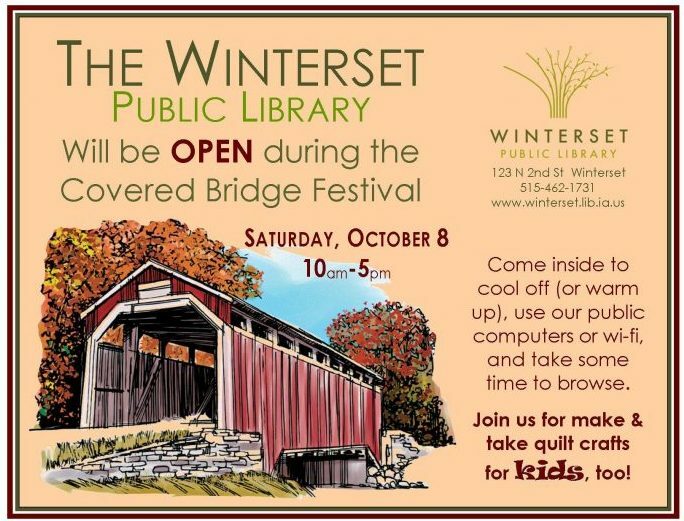 There will be at least three, and perhaps more, quilting-craft opportunities for small hands during the Covered Bridge Festival. The Winterset Public Library will be open on Saturday from 9:00 am to 5:00 pm and will offer a quilt craft for kids in their meeting room. The Winterset Art Center will be open Saturday AND Sunday from 9:00 am to 5:00 pm, and will also offer a quilt square art project that kids and parents can do together. 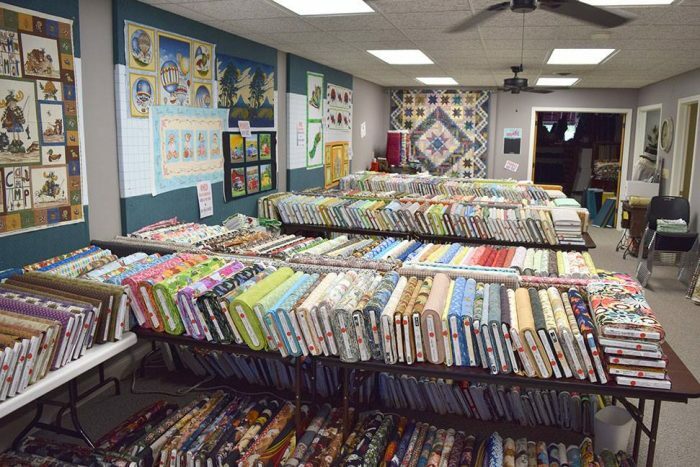 Over at Piece Works Quilt Shop, west of the Quilt Museum at 54 E. Court Ave., kids and parents can color on fabric that has been printed like a giant color book. The resulting art will be used in a future quilt project. Maybe we’ll see it at next year’s festival! While there, patrons can also browse the 1,000 Bolt Blowout sale, in which over 1,00 bolts have been marked down to $6.00 per yard. 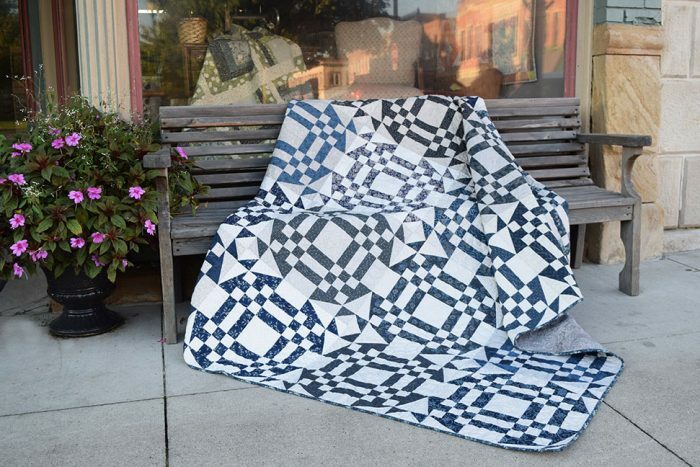 The 1,000 Yard Blowout is happening at Piece Works Quilt Shop through Sunday. 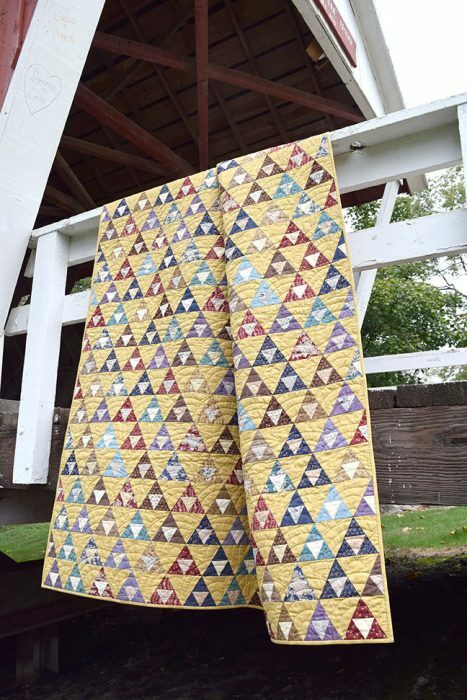 There is something at the Madison County Covered Bridge Festival for everyone every year, but if you’re a quilter, this might be your favorite one yet. Full details for the weekend, including maps and schedules of events and entertainment, can be found at www.madisoncounty.com. Thank you for reading The Winterset Citizen! 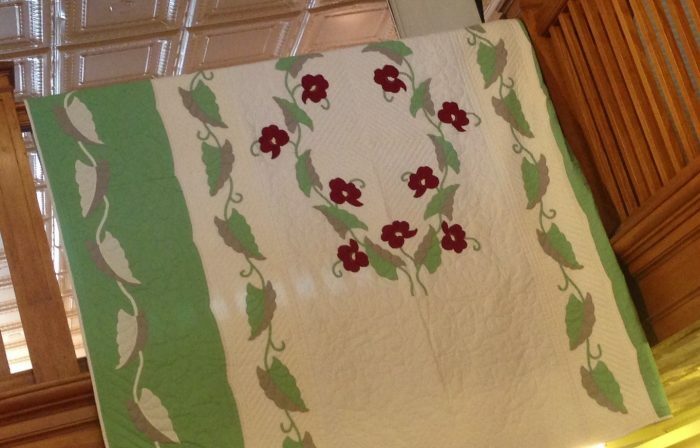 Again, don’t miss the Covered Bridge Quilters Annual Quilt Show on Saturday from 9am to 5pm, and Sunday from 10am to 4:00 at Winterset Elementary, 404 S. 2nd Ave.